The Lopi wood stove | Lopi Liberty wood stove is the cleanest burning large stove ever approved by the EPA. 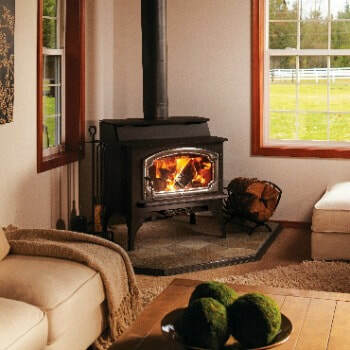 This Lopi Wood Stove can burn for to 12 hours! This largest stove made by Lopi, only produces 2.6 grams of emissions per hour. This unit sports both a cooktop surface for preparing food and great fire viewing area. Also, it features the largest firebox of any large stove. You can easily load wood up to 24 inches long into the unit. The unit’s unique step top design, delivers warming and cooking surfaces as well as convective and radiant heat. Offered with the GreenStart technology, simply load the wood and start your stove with a push of a button! No slow startups! If the project is outside of Southwestern Montana please visit the Lopi site for dealers that may be near your area. Bare's may only sell these products bought and picked up from our store location. Please understand we are unable to ship, sell, deliver, install, service or provide warranty for items outside of our area.